Death Angel: “Lost” Video Released! Death Angel: "Father of Lies" Single Released! Death Angel: “Father of Lies” Single Released! Death Angel: "The Evil Divide" Album Review By Rich Pia! Death Angel: “The Evil Divide” Album Review By Rich Pia! 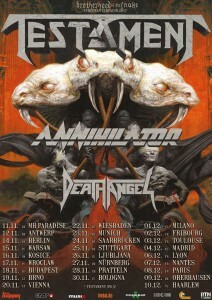 Slayer Has Just Announced A New Headlining Tour With Anthrax And Death Angel! The 2016 Rock Allegiance Lineup Includes Slayer, Killswitch Engage, Anthrax, The Cavalera Brothers And More!